ConvaTec Sur Fit Natura Visi Flow Irrigation Starter Set is a colostomy irrigation set that features flow visibility and control. 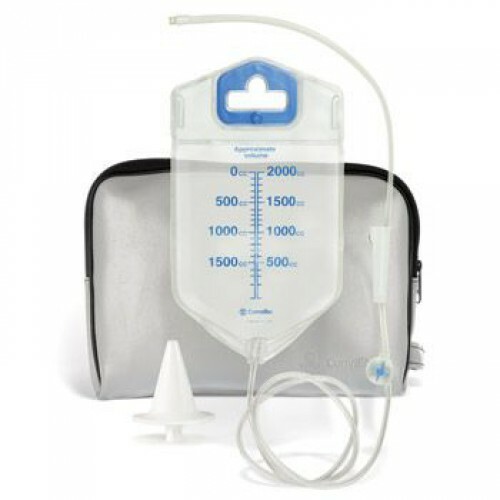 With easy front filling and removable stoma cone, this ConvaTec ostomy irrigation starter set is discreet, compact and non-invasive. Whether you lead an active lifestyle or are simply looking for an irrigation kit you can depend on as you go about your daily activities, this colostomy irrigation starter set is the right kit for you. ConvaTec Sur Fit Natura Visi Flow Irrigation Starter Set is an easy-to-use ConvaTec ostomy set that contains everything you need to get started. Equipped with a sleek carrying case, this irrigation starter set ensures that you have everything you need for a pleasant, easy experience. You may also be interested in similar colostomy irrigation products, such as Hollister Cone Irrigator Kit. Complete irrigation kit includes: 1 Visi-Flow Irrigator with Stoma Cone, 2 SUR-FIT Natura Stomahesive Skin Barriers with Flange, 2 Visi-Flow Irrigation Sleeves, 2 SUR-FIT Natura Closed End Pouches, 1 stoma lubricant, 1 ostomy belt, 1 tail closure, 1 brush and 1 carrying case. Features flow visibility and control, easy front filling and a removable stoma cone. Easy-to-use and discreet, this set allows wearers to comfortably and confidently perform their daily activities without limitations.